Emotionally charged, stunningly beautiful and delivering unprecedented dramatic character performance, Heavenly Sword showcases the power of PLAYSTATION®3. A dramatic tale of revenge sees Nariko, a fiery red-haired heroine embark on a quest for vengeance against an invading King and his army. 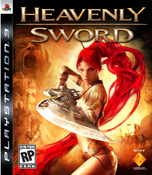 The story builds around the ancient Heavenly Sword which once belonged to a powerful deity. It can never be wielded by a mortal without it draining their life-force, killing them within hours. Andy Serkis, the world's leading CG actor, famous for his roles as Gollum in "The Lord of the Rings" and Kong in "King Kong", was heavily involved in the creative process. As well as starring in Heavenly Sword as the villain, King Botan, Andy was a major contributor to the character development, writing, casting, directing and performance capture for the Playstation 3 game. • The Heavenly Sword itself can Transform into Three Distinct Stances – Players can switch between on the fly allowing players to create their own fighting styles. • The Combat Engine can Scale Up – From sophisticated one-on-one encounters to one-on-many, where enemies employ intelligent squad-based dynamics, right up to combat against battalions pushing real-time gameplay and AI to unprecedented new levels. • Physics-based Combat – Players can sweep debris against opponents, kick tables to halt an oncoming surge of fighters, smash the enemy into the scenery or throw bodies into other enemies using aftertouch controls. • Wide Range of Objects and Weaponry – Including multi-skewering spears and devastatingly explosive bazookas. • Creative in-game Cinematography – Coupled with real-time story evolvement and amazing set-pieces makes the action feel like a blockbuster action movie and takes combat gameplay to new heights. Registered users can 'subscribe' to this group and receive an email whenever a news article is added that contains the tag 'Heavenly Sword'.